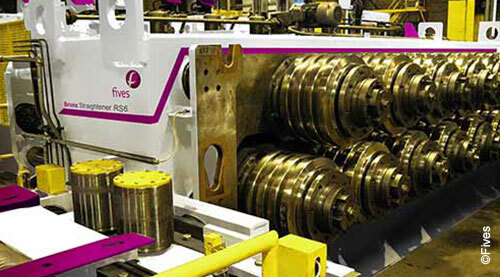 Fives produces the broadest range of high performance section straighteners available today; including fixed center, variable center, multi-strand, two plane and between housing. Bronx machines can accurately and efficiently straighten the widest range of ferrous and nonferrous sections produced. Engineered to rolling mill standards, these machines have a heavy fabricated steel main frame and can be built to provide single, two, three or variable operational speeds to suit individual requirements. Common among all designs, the top rolls are driven with the top work roll shafts having the option of motorized or manual adjustment. Large roller-type straightening machines with variable roll centers are used in straightening a wider range of sections than would be possible with a machine having fixed centers. As an example, the Bronx 11/18 has centers variable between 45” to 70” (1,140 to 1,780 mm) and is used to straighten various rolled steel sections from 6” x 6” (150 x 150 mm) angles up to very heavy sheet piles and large beams. When sections are straightened in line, following the rolling mill cooling bed, multi-strand straightening is frequently required to keep pace with the output of the rolling mill. Multi-strand straightening was initially performed using canti-levered roll shaft-type machines. However, to improve rigidity and to ensure that equal work was carried out on all sections, the between-housings design of machines with quick roll-change capability was introduced and has become a Fives standard. Depending on productivity requirements, the straightening machine may be either wide-bodied and slow running or narrow-bodied and fast running. The two plane machines are often used for straightening round, square and hexagonal material that enables the sections to be straightened on two planes in one pass. The between-housing design for straightening of square and round billets provides extra rigidity when long runs of similar profile materials are in demand. The rolls are mounted between the housings, which enables the machine to have shorter roll centers and therefore, handle a larger range of sections than would normally be possible. These machines have been specifically designed for the straightening of billets in steel mills. Fives was first to develop and patent a COMPuter Aided Setting System, the COMPASS System, to automatically compute the optimum roll settings and adjust the rolls to the proper position. This feature enables section size changes to be accomplished in approximately two minutes. In addition, the COMPASS system incorporates a machine management system.